Looking for a simple Valentine’s Day-inspired meal? This soup’ll do it. 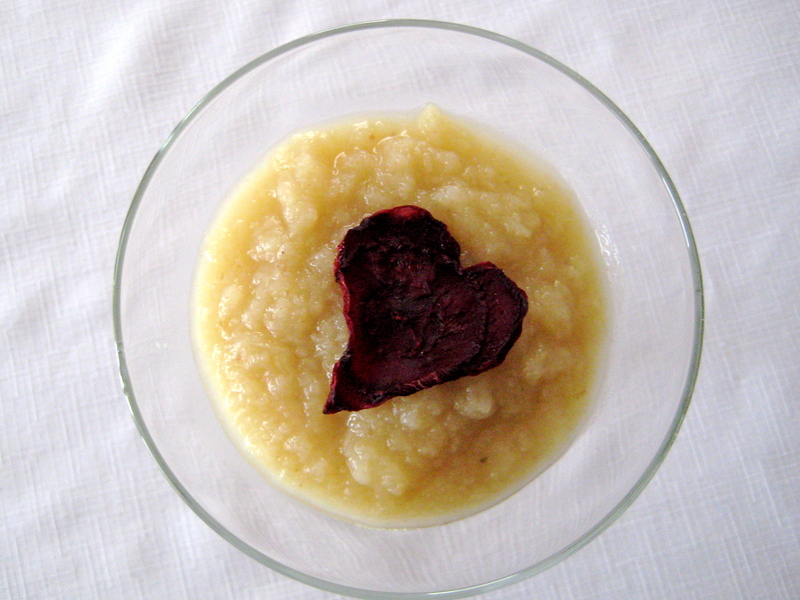 A slight sweetness thanks to the roasted garlic, parsnips, and onions, this soup is not only easy and delicious, but adds a love-inspired twist with a heart-shaped garnish. I like keeping it a little chunky for some texture (I do realize, yes, it sort of looks like applesauce! ), but you can also blend it until it is completely smooth. Preheat the oven to 400 degrees F. Lightly oil a baking sheet. Have the water boiling in a kettle. Using a sharp knife, cut the very top off of the garlic bulb, just enough to expose the cloves. Rub the top of the exposed cloves with some olive oil. Wrap the bulb in aluminum foil, and put on baking sheet. Toss parsnips and onion with more olive oil, and put them on the baking sheet. cookie cutter or paring knife, cut into heart shapes. One medium beet will make about 10, though you only need a couple hearts for garnishing. Lightly brush each heart with oil on both sides, then put them on the baking sheet with the garlic, parsnips, and onion. Transfer to the oven and set the timer for 20 minutes. When the oven timer dings, check the beet crisps. They should be done, but if they look like they need a little more time, leave them in longer until crispy (keep your eye on them, they’ll burn easily). The parsnips and onion mixture will need about 40 minutes total; the garlic about 50. When all ingredients are cooked through, set aside the beet crisps. Unwrap the garlic and once it is cool enough to handle, squeeze the cloves into a medium saucepan, along with parsnips, onion, and hot water. Bring to a boil, then reduce the heat, cover, and let simmer for 20 minutes. Remove the soup from heat. Add the milk and blend to desired smoothness. Serve warm, garnished with beet crisps.